About the medical debt: I’m glad it wasn’t a scam! As for the ethical aspects of it, I think by them time the debt is with a collection agency the original creditor has already written off part of the debt. I think the agencies buy the debt at a discount, and then attempt to collect less than the original debt but more than what they paid for the debt. I could be wrong, however, but if that’s the case then the original creditor has already taken the loss. As for the credit card transfers: I know they can work for those who are disciplined enough to follow through and NOT charge more. If you can make it work for you, then that’s awesome! And hitting the halfway point? WOOHOO!! Also, I may have missed it, but I never saw a response from you to the Navient news. Could you join a class action suit and get some joy there? I looked into it and it’s actually not open to the public yet. I think it’s still in a preliminary phase. However, I’ve made formal complaints that have been documented with CFPB (among others), and I think what I’ve experienced would certainly fall underneath the general suit filed by the government, so hopefully that will be an option in the future. Congrats! To many I know it’s crazy to be ecstatic about $70K in debt, but I totally get what you mean. I am in the same boat! That is amazing! I hope we can do as well as you have done. Regarding the Medical Debt–when the rest of your debt is totally clear, you could make a donation equal to the “forgiven” amount to the hospital or system that treated your husband. Then, you’re sort of still paying it back. I love this idea! Thanks for throwing it out there! Congratulations on hitting halfway!!!! That is amazing! I hope things speed up for you on the second half as they did me! I am sorry Ashley, but I find you totally dishonest. You are cheating on your medical debt. You have bought a house when owing massive amounts of money still. You are living in some kind of cloud cuckoo land and I am bowing out from reading this blog any longer. It began with honest, desperate people longing to be debt free and finally succeeding, Now there are three contributors just playing around with the idea and ethically very shaky. Is it dishonest to buy a TV on black friday? Is it cheating to negotiating a discount? Is it ethically shakey to make Use of a 2-for-1 Deal? To me it is not. And neither is What Ashley’s doing. She is making Use of an opportunity Provided by a third Party. She didnt pressure them into doing so. I am also pretty sure if The Hospital wasnt still making enough Money Off of it They wouldnt do it that Way. Also i really Like anon’s Suggestion. That seems Like a Great Idea to keep in The Back of your mind once youre Out of debt. Ashley, I really think you’re super honest towards your Readers.i admire you for Sharing The Good, The Bad and The ugly. I work for a hospital system, and what Ashley is doing is not at ALL unethical. I can’t believe you would even suggest that. Hospitals structure their charges to uninsured patients several times higher than what they charge insured patients, partially to cover the costs of collecting. Ashley has paid on time, and in accordance with her agreement with the hospital always. She has likely more than covered the actual cost of care. And when the hospital wants a cash infusion, they often make these offers. Everyone is happy – the hospital gets a big chunk of cash, and the patients have paid off their bill. Pay no attention to yhis comment Ashley, and keep up the good work! Love the comment right before this from the hospital employee. Please ignore the negativity – we are so invested in your journey and want to be here with on the way. You are the reason I come visit the site! I can certainly vouch for this. At a time when we were uninsured (unemployment, tough times and cancer diagnosis) and needed medical care, our medical bills were exorbitant in comparison to the times we were insured. I would have no problem settling a debt like this through a third party if we had met all terms of repayment along the way. Do you think it is ethical for a hospital to double and triple payments to desperate people in need of medical care? Ashley’s situation is different in that they have adequate income, but nevertheless, she took a legitimate offer. Giving a donation back to the hospital seems good to me for Ashley and hubby to do. Maybe, just continue the $25/month. It’s always good to be giving back something to someone each month! To each their own. I have zero moral qualms about it (for the reasons I’ve provided in the blog post above). It would be interesting to me to compare numbers for how much their administrative overhead is (sending monthly statements, having people enter payment info into their database, and anyone else “touching” my account) for the period of perhaps 7 years total?? Versus what they received in a very prompt manner after they initiated this deal (again – I did not ask for it – they initiated it). My guess is that they’re probably coming out ahead given the savings in all the administrative costs. But I certainly understand that others may feel differently than I do and that’s 100% okay. We are each entitled to our own opinions. Last year I called to make a payment for a medical bill, while on hold and listening to the recorded message it mentioned a discount for full payment. I was going to pay the bill in full anyways, so I asked about the discount and they gave me 10% off. It made me very happy. It pays to listen to the recording. I always ask for paid in full discounts and get them 50% of them time. Discounts for early payment are very common across many, many industries. This is such a good tip, in general! On a radio show I listen to the DJ’s did a radio “stunt” one year around Christmas time to see whether they could get discounts on all types of crazy stuff simply by asking, “Is this the best price you can give me?” It was a few years ago now so I don’t remember all the details, but I remember being SHOCKED not just at the amount of discounts – but the variety of places that offered them! Like, even at big box stores and retail places where you don’t think you can just haggle or negotiate on prices…but they did!!! WOW! I know people are entitled to their opinion, but really Chantal? Your comments are so far off base. As Marzey has pointed out this is industry practice. Furthermore, Ashley is not being dishonest about anything. She has been forthcoming and completely honest about her situation, including how she is going to handle the medical debt. Debt repayment looks different for everyone and if Ashley could afford to buy a house it’s quite frankly none of our business when/how/why she does it. It is also worth noting that her mortgage payment is less than her rent. I am not sure what “cuckoo land” you are referring to, but debt repayment does not have to follow the Dave Ramsey model. Ashley, hold your head up high. You are doing it your way, putting yourself out there, and for that I thank you. This is sort of tongue in cheek, but “cuckoo land” is reading the itemized statement for your invoice and realizing that you were charged $30 for ibuprofen, $20 for the extra blanket you asked for, etc. and so forth. Cuckoo land is also discovering that a five day Z-Pak costs $70, but the 7 day Azithromycin costs $12. Same active ingredient, just different dosages spread over two extra days. My husband and I were each prescribed one over a two day span for the exact same infection and both were filled at the same pharmacy. Imagine my annoyance when I was reviewing the pharmacy charges and saw the massive price difference. At no point in time did anyone point out that there were different dosages available at different prices. The medical industry is definitely NOT where I would feel guilty taking a discount that was offered!! It is also worth noting the Dave Ramsey routinely advises folks on his podcast about how to settle for credits and medical debt. Just part of the process, folks! Walnut’s comment is PERFECT!! I absolutely agree. They are still getting their payment, no doubt about it. Ashley was not dishonest or unethical, what an outrageous accusation. The US healthcare industry is so overpriced it’s bankrupting families left and right. Of course you should try to haggle. Walnut provided perfect examples. When I delivered my son I was charged $21 PER prenatal vitamin. Yet I could get a 90 day supply for $7 at the damn pharmacy. The mark ups are insane. Good for you Ashley, and ignore the ridiculous comments. You’re the only blogger here at BAD that has shown she has the drive to get out of debt. I’ve enjoyed following your journey. JP – That is crazy! I’m glad she looked at her bill! Congrats on hitting the halfway point! Meanwhile, I’m over here celebrating being 25% of the way there and having paid off my car recently…progress! YAY!!!!! Paying off our car was a HUGE milestone for us, too! We did it in January of last year (2016) but I still remember the “high” as if it was just last month! Congrats! Keep up the momentum! One little side note on the settlement is that you may have to pay taxes on the amount “forgiven”. When we settled with a credit card, we had to pay taxes on that amount. Not sure if it’s the same on medical debt but I would check and make plans for that accordingly. Good point. I wrote a long post about this in the comments section on the settlement blog entry. In a nutshell, if you can prove you were insolvent at the time you settled the debt you can (likely) avoid the tax. I advise a good accountant in these matters. 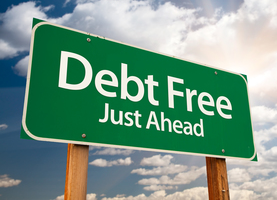 I have settled debt for clients and have practiced in the area of bankruptcy law for years. It’s a common issue I see. YES!!! We’ve never had a “real” accountant (and by that I mean someone we’ve had a long-standing relationship with – we’ve used H&R Block and walk-in type places like that, but no one worth returning to). That’s definitely on the docket this year. I need to get on that STAT because I know the months just fly by as we march toward tax day! Wow, this is fascinating! I honestly haven’t even thought about this as a possibility. It’s good for me to hear about it, though, just to be mentally prepared if nothing else. I’m sorry you’ve had these experiences! I can completely relate. After paying off my student loans in 2 years, I was surprised people would take it so negatively. I commented on this previously in a blog post, but people often try to down-play our hard work with snide remarks. I don’t know if it is jealousy or maybe feeling bad about their own financial situation? People will find any way to be nasty. I recently told some friends that I was not saving for my child’s college education, but instead was focusing on maxing out my Roth IRA. I further indicated that I had no intention of paying for my future children’s tuition, but would follow my parents lead and instead cover room/board/living expenses. People were OUTRAGED! They couldn’t believe I would saddle my child with ALL THAT DEBT. Yet, I just priced out the tuition costs for 125 credit hours at the the state university in our city, and those credits would cost ~25k today. Obviously the price will be higher ten years from now, but no, no I do not feel guilty about asking my child to carefully consider the cost of tuition at various schools. There are no loans to fuel my retirement and I have no qualms about prioritizing it over my child’s college tuition. Heck, daycare right now costs more per year than their tuition would at the above referenced university! You should consider your child’s future! Part of having children is helping them to prepare for life. I consider that a parental responsibility. Just sticking your head in the sand and telling your child to “figure out life” is not the answer. I’m fine with the negotiated payment on the medical debt. If they contacted you and proposed a settlement, take it. They have already figured out their profit margin and are willing to take less. As for the balance transfers, as long as you do the transfer and pay it off and don’t get dinged with a high interest rate, I say do it. Some people wouldn’t be organized (or maybe even understand what they are getting themselves into) but you do so save some interest. I just wished your student loans had lower balances so you could knock one off a month once the medical debt it gone. You will be done with debt before you know it!